Nothing Stirs A Male Lion Like? Nothing stirs a male lion like, the laughing cackling call of hyenas. They are mortal enemies. When the numbers favor them, hyenas in large gangs chase female lions off kills. As cubs, lions live in fear of hyenas, for hyenas will kill lion cubs if they can. 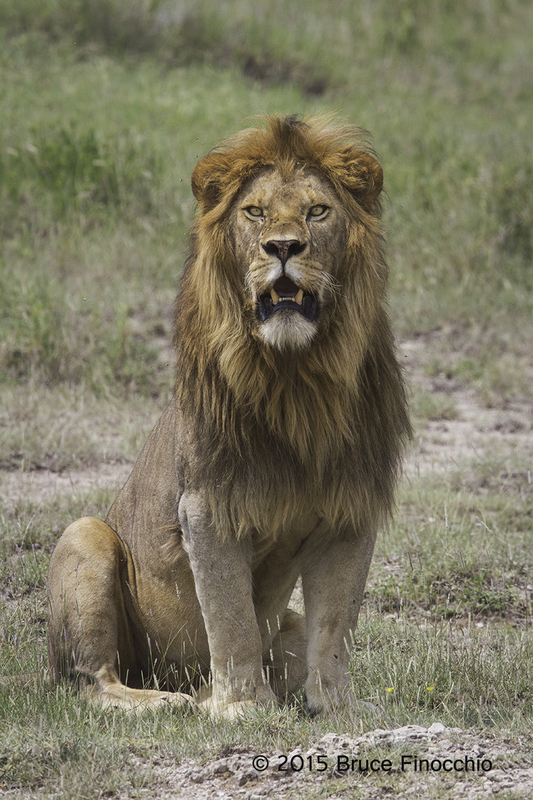 With incidences from their youth, male lions remember and as adults will go out of their way to kill hyenas. It’s war; combat where lives are at stake. 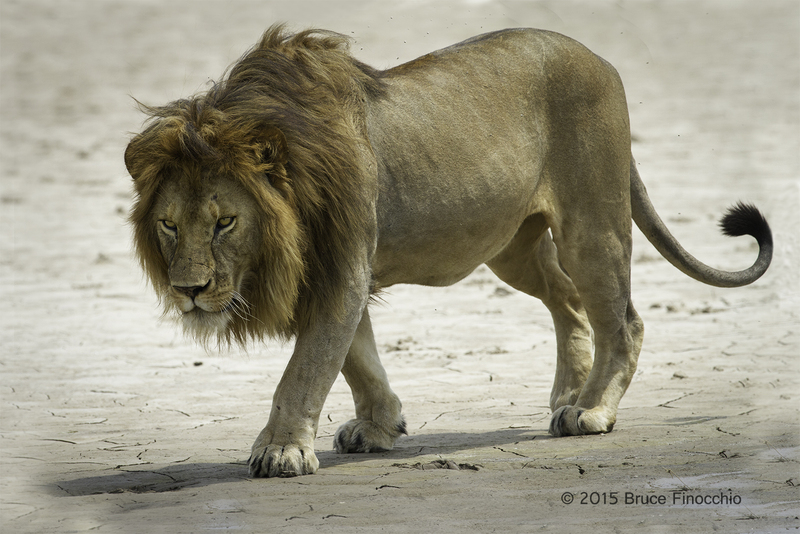 This male lion perked up during the midday heat when he heard the far-off call of hyenas. You can see the alertness and the readiness to engage in battle if the threat comes. We were patrolling in the vastness of the Serengeti, heading south from our lodge in the middle of this giant National Park. We would follow the tree-lined valleys looking for game. These valleys were a good place to find leopards, but not today. As the trees petered out, we came upon a pan, with a little water in the middle of a sea of grass. It was here that we found two male lions. One seemed a bit younger, a red devil, with a very reddish mane, and not fully grown in. Not brothers because of the difference in ages, but probably cousins, and from the same pride. Their mothers were probably sisters. Both were lounging along the water of this recently filled pan when we coast up to them in our land rover. It was my first trip to the Serengeti and East Africa. Like many, I was really struck by the vastness of the plains. Here in the southern Serengeti, there weren’t many trees. These plains extended all the way to the horizon, shimmering in the midday heat. When the distant hyena calls became louder indicating the hyena clan was getting closer. 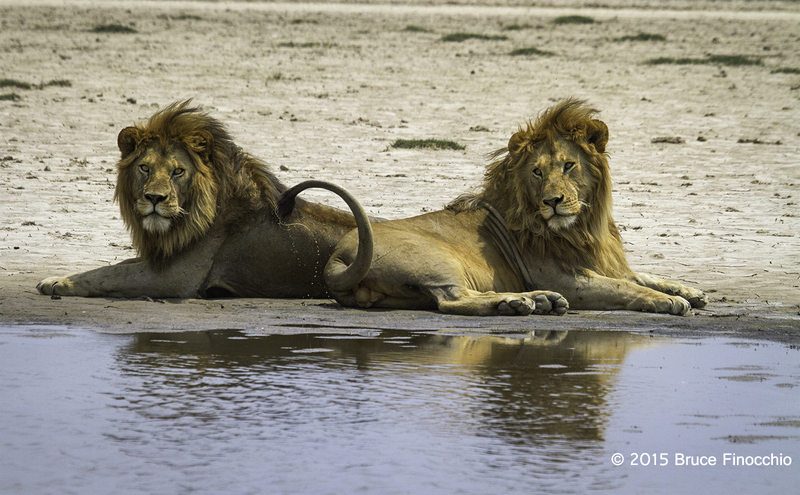 The larger and older of the two males awoke from his lazy sleepy place along the pan. After pacing around a bit, he faced the direction of the calls and tested the wind; here was an aroused big cat ready to do battle. It was a moment we were hoping for, some action, and this big cat gave us everything we could have ask for as he sat up and tested the wind for his enemy. Here in this image you really could see and feel his intent; this male lion is truly the “King of the Beasts”. With Lions disappearing in Africa, down to less than twenty thousand, and the latest trophy hunting controversy and killing of Cecil, the famous male lion, in Zimbabwe. I felt lucky and humbled to have seen these two male lions and shared a little time with them, just being in their magnificent presence was so special. I hope to go back to East Africa, maybe, next summer, in the dry season this time. Maybe, a visit to Kenya and the Masa Mara too. If you would like to join me and experience moments like these images depict, please stay tuned, my friend John is working on another trip. Africa is an incredible place, and in the Game Reserves and National Parks, you still can see wild Africa as it once was. Thank you, Oliver, for the compliment. Thanks, Mike… It was a pleasure writing the story behind the images. Thank you for taking such beautiful photos of these lions and for more knowledge about them.